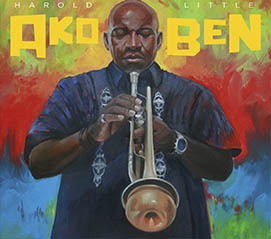 A D.C. native, with a big warm focused sound and impeccable rhythm to his credit, composer and trumpeter Harold Little reaches deep into his bag of trumpet magic and invokes one good track after another on Akoben. Named for the Adinkra symbol for ‘war horn,’ Akoben is the inspiration for Little’s debut offering. The project is a fusing of jazz, funk, rhythm and blues, as well as the ever-popular go-go genre, all combined with the energy of ancient West African wisdom to create a unique sound. On Akoben, Little’s flugelhorn and trumpet are front and center on twelve tracks. There is a combination of both originals composed by Little and arrangements of standards eloquently reimagined by Little. Both naturally feel like an extension of Little’s musical mind, whether improvising or writing, he possesses the chops and technique, to surprise and entertain at every turn. Little brews up a sound that’s unique and highly addictive, as the listener you will find yourself humming the melodies long after the tune is over, which signifies the true merit in the tunes. Opening with an elegantly funky piece entitled “East of the River,” Little fills the listener’s ear with his relaxed trumpet lines over a stunning groove. With the ensemble kicking up the smooth groove under Little, he takes the piece slowly, turns it into something truly spectacular as he dips and dives with his muted trumpet playing. Fans of relaxed R&B get some surprises, with tracks like the riff inspired “Step.” Little weaves his trumpet lines in seamlessly, making it as much as a delight as the compositions is itself. It’s a mix of controlled phrases, many sonic colors and relating to the rhythmic style, this mix comes together and makes Little’s music sparkle. Other gems include Paul Desmond’s “Take Five.” Little displays his jazz elegance and treats listeners to a supremely funky version of this classic standard. One can’t help but be a swept away, hoping that those achingly, love soaked trumpet lines would just go on forever. This is Little’s fifth release in a strong discography of hard-hitting recordings, and Akoben represents the next in the succession of and even stronger offering. Solidifying Little in the jazz and contemporary idioms as a player to be reckoned with. A highly recommended listen. 1 Comment on "Harold Little | Akoben"
Nice!! I will spread the word! !